Will Greece 50% Debt Default Plan Fix the Euro-zone? Last Thursday, October 27, European leaders secured an agreement from eurozone banks to take a 50 percent loss on the face value of their Greek debt. The leaders also set in place a plan to force banks to raise new capital to insulate them from potential sovereign-debt defaults. The banks must meet 9 percent capital reserves by June 30, 2012. It is estimated banks' capital needs will stand at 106 billion euros. Eurozone policy makers have also agreed to expand the emergency bailout fund to $1.4 trillion from $610 billion — suggesting it could provide guarantees for around $1.4 trillion of bonds issued by countries such as Spain and Italy. But will this new plan set the platform for healthy economic growth in the eurozone? We suggest that what is needed to set a platform for healthy economic growth is raising the level of capital in the overall economy, not just in the banking sector. The key source for the lifting of capital in the economy is an expanding pool of real savings. Although it is not possible to quantify this pool, one can ascertain the factors that undermine it. We hold that an important factor behind the present eurozone economic crisis is past and present loose monetary policies. For instance, after settling at 7 percent in July 2007, the yearly rate of growth of the balance sheet (monetary pumping) of the European Central Bank (ECB) jumped to 53 percent in January 2009. 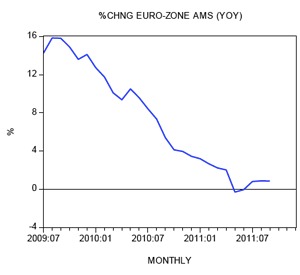 In response to this the yearly rate of growth of the eurozone, AMS climbed from 0.3 percent in July 2008 to 15.8 percent by August 2009. Also the ECB policy interest rate was lowered from 4.25 percent in September 2008 to 1 percent by May 2009. It was kept at 1 percent until March 2011. We hold that this loose monetary and interest-rate stance has contributed to a large misallocation of real savings in an already-distorted environment created by previous reckless policies. Instead of being employed to generate real wealth and thus beefing up the capital base, real savings have been squandered by various bubble activities that emerged on the back of loose policies. Large government outlays and the subsequent large debt as a percentage of GDP are another factor behind the damage inflicted to the pool of real savings, which in turn has weakened the process of capital formation. Thus, in Germany, government debt as a percentage of GDP stood at 83 percent in 2010 against 74 percent in 2009. In France, the percentage stood at 82 percent last year against 79 percent in 2009. In countries such as Greece and Italy, the percentage displays buoyancy. The percentage of debt from GDP stood in Greece at 160 percent in 2011 versus 130 percent in 2009. In Italy the figure stood at 120 percent against 116 percent. Meanwhile the ECB reported on October 6 that the tightening of credit standards by eurozone banks picked up significantly in Q3. Sixteen percent of banks said they have tightened loan terms, compared with 2 percent in Q2. Furthermore, according to a Bloomberg survey, banks across the eurozone have announced they will trim more than 775 billion euros from their balance sheets in the next two years to achieve the 9 percent in capital requirements. 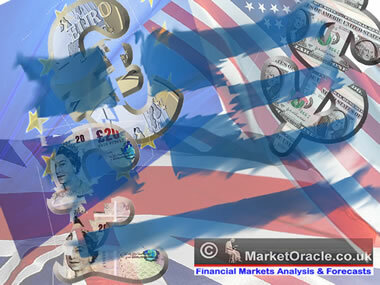 Some experts are of the opinion that bank deleveraging could reach 5 trillion euros in the next three to five years. Policy makers and most mainstream economists would prefer, however, that banks' recapitalization take place without a process of deleveraging, which they view as bad for the economy. The popular view as to why deleveraging is bad for the economy can be supported by the following example. Take for instance company X, which has equity of $200. The company borrows $800 and buys an asset worth $1,000. In this example we can say that company X has a leverage of 5. That is to say the equity of $200 represents 1/5 of the $1,000 asset. If the value of the asset falls by 10 percent, that is, to $900 given the debt of $800, it implies a fall in equity or net worth to $100 — or 1/9 of the $900 asset, raising the leverage from 5 to 9 and making company X less solvent. Let us now assume that company X has decided to deleverage and to lower its leverage back to 5 (by doing this, the company will become more solvent). To achieve this goal, company X sells assets for $400 and reduces its debt to $400. Consequently company X will now have $500 in assets, $100 in equity and $400 in debt: the leverage is now 5 again. But if many companies try to lower their leverage, then there is a risk that the value of assets will fall. If, for instance, the value of company X's assets falls by 10 percent to $450, then, given the value of debt of $400, net worth falls to $50 implying that the leverage goes back to 9. From this we can conclude that a pressure on European banks to bolster capital could force them to cut assets. However, by cutting lending — trimming their assets — banks are forcing various borrowers to sell off their assets to prevent insolvency. Consequently this sets in motion asset-price deflation. This in turn lowers borrower collateral and causes banks to reduce their lending further, etc. It follows that if all financial institutions are doing the same thing (trying to fix their balance sheets), they could drive asset prices down, which for a given debt will shrink their net worth and increase their leverage, or make them less solvent. This is the paradox of deleveraging. If this process is not arrested in time it could lead to a liquidity crunch and seriously damage the real economy, so it is held. This means that any side effects of deleveraging such as a credit crunch and economic slump should be aggressively countered by the authorities by means of loose monetary policies. Is Deleveraging Really Bad for the Economy? Is it true that if every bank were to attempt to "fix" its balance sheet, the collective outcome would be disastrous for the real economy? On the contrary, by adjusting their balance sheets to reflect true conditions, banks would lay the foundation for a sustained economic recovery. After all, by trimming their lending, banks are likely also to curtail the expansion of credit "out of thin air." It is this type of credit that weakens wealth generators and hence leads to economic impoverishment. Contrary to the proponents of the "paradox of deleveraging," we can only conclude that if every bank were to aim at fixing its balance sheet, and in the process curtail the expansion of credit out of thin air, this would lay the foundation for a healthy economic recovery. We suggest that the crunch in the eurozone will occur not as a result of deleveraging as such but because of the damage inflicted on the process of capital formation by past and present loose monetary and fiscal policies. In the meantime, a fall in the yearly rate of growth of eurozone AMS from 15.8 percent in August 2008 to minus 0.3 percent in May this year is severely undermining various bubble activities. We suggest this is good news for the capital-formation process and wealth creators. We maintain that this decline in the growth momentum of money supply is depressing various bubble activities, and this in turn is manifested through various popular economic indicators. For instance, the latest data show that manufacturing activity in the eurozone has weakened further in October. The purchasing management index (PMI) fell to 47.3 from 48.5 in September. In October last year the PMI stood at 54.6 — our monetary analysis points to a likely further weakening in the eurozone PMI. Also, the PMI in the services sector has weakened in October. The index fell to 47.2 from 48.8 in September. Using the lagged growth momentum of real AMS, we can suggest that the services PMI is likely to weaken further. Furthermore, in response to a weakening in economic activity, which we have seen is good news for wealth generators, the ECB is likely to lift its pace of monetary pumping. This we suggest is going to delay meaningful economic recovery. In fact the ECB has already lifted the pace of pumping. The yearly rate of growth of the ECB balance sheet stood at 23 percent in October versus minus 9.5 percent in June. We can conclude that, while a current fall in the growth momentum of Euro AMS is positive for the capital-formation process, the likely tampering by the central bank to counter the bust of bubble activities is likely to make things much worse as far as the process of capital formation is concerned. Again, we maintain that the present crisis is due to past and present loose monetary and fiscal policies. We also suggest that, given the severity of the crisis, this raises the likelihood that the pool of real savings is badly damaged. This means that to fix the eurozone problem what is needed is to address the factors that undermine this pool. So, any policy that endorses a tighter monetary and fiscal stance will lay the necessary foundation for a buildup of capital and will set in motion a solid economic expansion. Obviously a tighter stance will wipe out various bubble activities that have emerged on the back of loose policies. The larger the percentage of these activities is, the more severe the economic bust is going to be. The bust however is a good thing, because it provides more scope for wealth generators to get things going. However, we are doubtful that eurozone policy makers will allow a proper cleansing — in fact, they have stated that banks' deleveraging must be countered. We have seen that deleveraging is good for wealth generation, and hence we think that the latest eurozone plan will not produce meaningful results. Last week European leaders secured an agreement for eurozone banks to take a 50 percent loss on the face value of their Greek debt. The leaders also formulated a plan for the recapitalization of banks. Also, policy makers have agreed to expand the emergency bailout fund to $1.4 trillion from $610 billion. We suggest that what is required to fix the eurozone is not just strengthening banks' capital bases but strengthening the capital base of the eurozone as a whole. Policy makers insist that the banks' recapitalization must take place without a process of deleveraging, which they view as bad for the economy. This means that the authorities will aggressively counter any side effects of deleveraging, such as a credit crunch or economic slump. We suggest that, on the contrary, deleveraging is necessary to clean up the system and lay the foundations for solid economic expansion. In fact, any policy aimed at countering the deleveraging process will only make things much worse.